Our mechanical/electrical/structural installation crews are experienced in the proper installation and startup/training of co-generation systems. As part of our scope of supply, Moss consultants will meet with the local utility to ensure that all requirements are met and to also answer any equipment/control questions they may have. This makes permitting the project much easier. Moss can also provide all required foundations and buildings for your electrical facility. Our project team provides a high level of planning that assures our customers the project meets their specified completion time schedule. Shown above is a Moss PLC control system with stainless steel gauge panel. Control system was provided to run dual Coppus RLHA turbines with a 700 KW twin shafted induction generator system. Moss can supply air or water cooled condensers for cooling steam or creating vacuums. 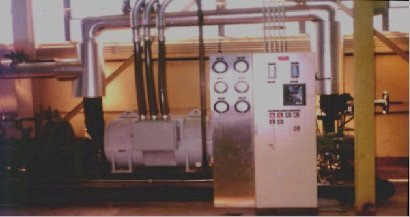 These devices allow the turbines to produce the maximum electricity, while assuring all of the steam required for the plant process, if applicable. Shown below are two (2) air cooled condensers, each rated for approximately 10,000 lbs./hr. of steam flow. Air cooled condensers can be provided for more flow but are custom designed beyond the above stated steam rate.